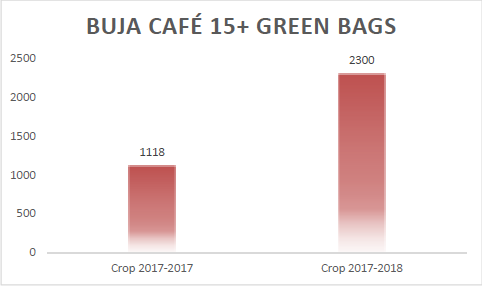 The company Buja coffee 15 plus in partnership with Munkaze coffee washing station since 2016. At Rubagabaga Sebatigita family plantation (17 000 coffee trees) probably the Mibirizi was planted in the years 1930s by the grandfather Ntirandekura. In the past 4 years trees are replaced by the Bourbon BM 139 variety. At Munkaze farm, near the coffee washing station, the coffee plantation has 8 000 trees. The total plantation of the family has 25 000 trees. and the small farmers neighboring the station around 400. Mrs Sebatigita Odette and Ephrem are also members of the cooperative as coffee farmers. sale of the green coffee. The cooperative receives a premium of 50 Fbu per Kg for the collaboration. Pulped, single fermentation, grades in a washing channel, skin dried under shade with parchment hand sorting, and finally sundried on African beds. sorted for unripe and overripe by the farmer. At the washing station, the same process of sorting is done again by the farmer, before it is accepted. the parchment coffee is soaked under clean water for about 10 to 12 hours. is ensured. Naturals are dried during 21 days in one layer. The day by day micro-lots are separated and the samples will test by Ephrem Sebatigita. The highest scores, above 86 SCAA, will sold separately as specialties. The coffee of BUJA CAFÉ 15 plus is milled by the HORAMAMA Coffee dry mill owned by the cooperatives members of the COCOCA Union.